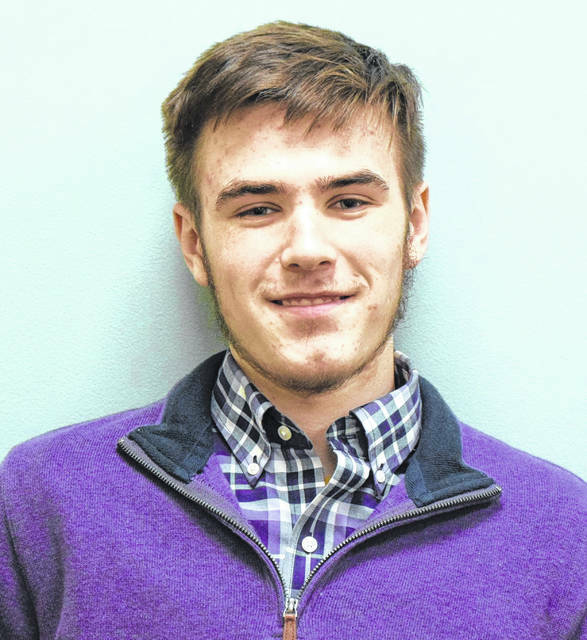 WAYNESFIELD — Gallant Shephard, 18, a senior at Waynesfield-Goshen High School, hopes to pursue a career in sports management after he graduates. He’s been accepted into Wilmington University. “I was told that they have one of the best small college sports management programs in the state,” said Shephard. He’s been involved in both outdoor and indoor track as well as golf while at W-G.
“I’m planning on running track at Wilmington. (Doing sports) really has taught me how to be a leader in social groups and how to take initiative in group situations,” he said. Through the Spanish Club, been able to see other parts of the world. “My sophomore year, I went to Costa Rica and it was a whole different ball game. I just didn’t expect how different it would be over there than it was here. We went through the town of San Juan and it was completely different than what it was in America,” he said. This past summer he traveled to Italy and Greece. “Italy was a lot more set up in a way. Greece was more nature and there wasn’t a lot of people and I feel like Greece was a lot nicer to Americans than Italy was, so that was really cool,” he said. Shephard likes the experience he’s gotten at Waynesfield-Goshen. “I really like the education. I’ve been told it’s some of the best education you can get in northwestern Ohio. You get hands-on with every teacher. There’s like 15 kids in every classroom and I know every teacher on a personal level so that really helps me grow and expand my knowledge,” he said. Academically, Shephard is in the top five in his class. He takes advanced math and has taken several College Credit Plus classes. “He has many hidden talents. Along with his academic standing, he is one of our leads in our musicals on a constant. As a track athlete for us here at the school I think he’ll be a great representative when he leaves W-G out into the future,” said principal Brian Hogan. Reach Sam Shriver at 567-242-0409.